history | Brazil Energy S.A. In 2001, during the Brazilian energy crisis, Brazil Energy led the formation of a consortium for the creation of Brasympe Energia S.A., aiming at supporting the Emergency Power Generation Program launched by the Federal Government. The Emergency Power Program was used as a guarantee of power offering until the restoration of normal power service conditions in the National Interconnected System (SIN). To do that, the deployment of thermoelectric power plants was encouraged, by considering the shorter installation term and lower investment when compared with hydroelectric power plants. 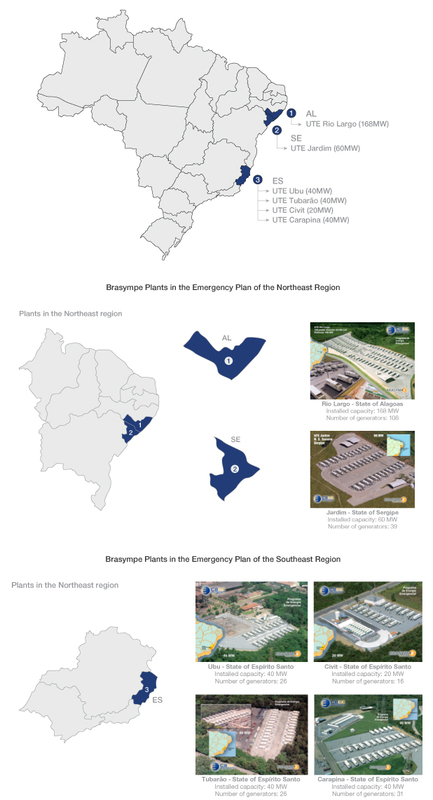 In this scenario, Brasympe stood out as the largest Independent Power Producer (PIE) of the Emergency Power Program, with a total installed capacity of 368 MW, distributed among six power plants: four in the state of Espírito Santo (140 MW), one in the state of Sergipe (60 MW) and one in the state of Alagoas (168 MW). During the emergency plan, Brasympe’s income was approximately US$ 110 million / year, which was one of the Top 100 net incomes in Brazil during that period. In 2005, upon the termination of the agreement with Companhia Brasileira de Energia Emergencial (CBEE), the Thermoelectric Power Plants (UTEs) were demobilized, with the equipment being sold to the North-American market. During this period (Phase 1), Brasympe provided return to shareholders equivalent to 6.5 times the investment, significantly higher than the returns provided by market securities. The image below illustrate the emergency power plants and their individual locations. In 2007, Brasympe acquired 60% of UTE Termocabo S.A. (Termocabo), which has an oil-fueled thermoelectric power generation plant with 48 MW of installed capacity. Soon after being acquired by Brasympe, Termocabo negotiated a capacity leasing agreement with Petrobras until December 2009, and in May 2007, it successfully attended the A-3 power auction conducted by the National Agency for Electrical Power (ANEEL), being awarded a 15-year Power Purchase Agreement (PPA) with the power utility companies, with start of supply in January 2010 and end of supply in December 2024. The chart below shows the current shareholding structure of Brasympe, which has large Brazilian corporate groups with complementary know-how as its shareholders.